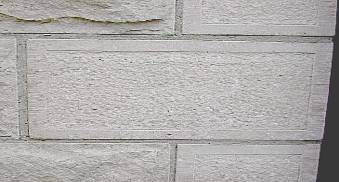 REAL NATURAL SANDSTONE CLADDING – FACES SAWN OFF ACTUAL ROCKS – NOT IMITATION COMPOSITE OR A LOOK-ALIKE. * Being a totally natural product, colour variations etc may be expected. 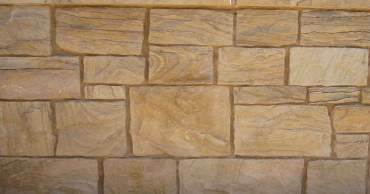 This is a hazelnut coloured relatively hard durable sandstone with pronounced dark orange brown banding and patterning. Suitable for wall cladding (internal and external). Paving either with honed (matt finish) for internal use, or with a honed, sawn or sandblasted surface for external use. Also suitable for wall capping, steps, pillars, gate finials, table tops, urns, fountains, columns, garden seats, carving etc., can be polished. 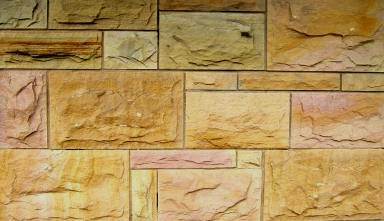 This is a biscuit yellow coloured durable hard sandstone with soft darker yellow orange banding and some patterning. Paving either with honed (matt finish) for internal use, or with a honed sawn or sandblasted surface for external use. Also suitable for wall capping, steps, pillars, gate finials, table tops, urns, fountains, columns, garden seats, carving etc. 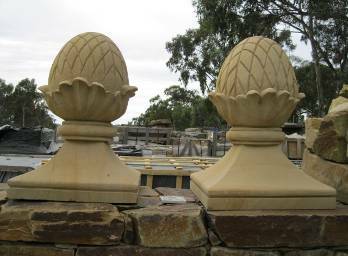 This is a mustard yellow to beige coloured sandstone, of moderate hardness and is durable, with very little patterning or banding. Also suitable for wall capping, pillars, steps, gate finials, table tops, urns, fountains, columns, carving etc. This is an olive yellow to olive green coloured sandstone, with a nice textural appearance and subtle banding in some pieces, durable with moderate hardness. This is a misty white coloured sandstone with a slight greenish grey tinge and grey speckles, rarely with yellow and pink tinges – a hard and durable sandstone which can be polished. This is a muddy red coloured hard durable very fine grained sandstone, with a good surface texture but little banding or patterning, can be polished. This is a very dark grey to black coloured very fine grained sandstone, hard and durable with a nice surface texture but no pronounced patterning or banding. This is a dark bluish grey colour, very fine grained sandstone, hard and durable with a nice surface texture but no pronounced patterning or banding. Cladding has a very similar appearance to the classic Victorian bluestone. This comes in sawn edged blocks with a pitched rock face, sawn back and of various sizes (our standard stock sizes are 400x75mm, 400x160mm, 400x245mm and 500x330mm), 25mm thick at edges of blocks, to a maximum of 50mm thick at centre of block. May be produced in other sizes to suit (a maximum size and volume limits do apply). 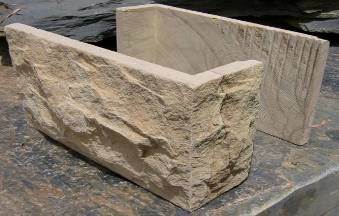 This style can be produced in any of the different sandstone colours. Corners are available cut from a single stone piece shown below – alternatively corners may be mitred onsite. 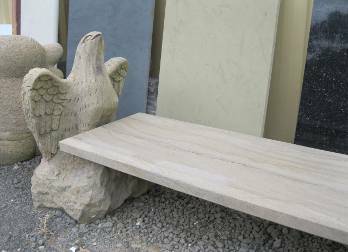 This comes with natural break edge random shaped pieces of variable size, with a natural rock face and sawn back. Veneer pieces may be hand chipped on site to fit the variable sizes together. All 8 different colours of sandstone veneer all hand chip well – use similar methods as for hand chipping paving. Average thickness is 40mm (range ~30-50mm). Average piece size 200x300mm, (range ~100x100 to 600x400mm). Corners are available cut from a single stone piece with sawn edge shown below – alternatively corners may be mitred onsite. This photo the stone is laid in a full “random shape” configuration. The rectangular varied size sandstone veneer pieces can be mixed with the random shape varied size to effectively produce a wall looking somewhere between the two extremes. Mushroom Stone corners may be used with random stone walls for a more formal look to the corners. 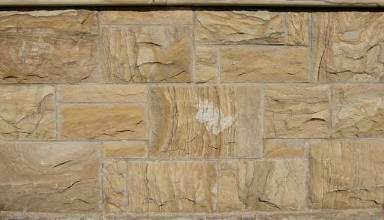 Should a more varied coloured wall be required – two or more of the different sandstone colours may be intermixed in varying proportions to best suit colour requirements. Other finishes and styles can be produced to order – subject to physical practicality. Corners are available cut from a single stone block (picture above of external and internal views) - thus no glue line is present and the stone patterning/banding aligns, alternatively corners may be mitred onsite by you or pre-mitred by us at our facilities in Castlemaine. Standard size of stocked corners is 400mm (long wing) x 120mm (short wing) x 245mm high, and 500mm (long wing) x 120mm (short wing) x 330mm high, thickness 25mm at edges of blocks, to a maximum thickness of 50mm at centre of mushroom – with a sawn edge and hand pitched rock face - sawn faces internally for easy fixing. Corners can also be produced with rifled edge border and bush hammered centre. Made from a single stone piece with cut out centre. Entire wall cladding can also be produced in this style. Corners with rifled (scutched) edge and pitched rock face centre (similar to many early styles of stone work – made from a single stone piece with a cut out centre. Available on request – not a standard stock item. * The Sandstone Cladding as supplied by Pyrenees Quarries is produced by diamond sawing the faces off natural sandstone rocks, so when erected no visual difference from solid stone construction is normally discernable, that is – the end result looks like solid stone and not a cladding. 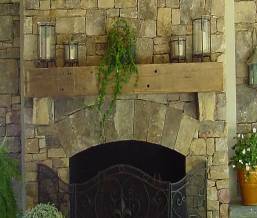 * These products are natural quarried sandstones - not an imitation or artificially manufactured product. * The sandstone veneer is produced from 8 different coloured sandstones – this gives a wide range of colours or colour combinations to select from. * Sandstone paving, either for internal flooring or external pavers can be produced from the same sandstones, hence you can achieve a perfect colour match, with sizes and surface finishes to suit. 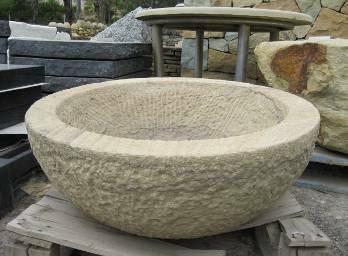 * Hand carved or diamond machined building accessories or landscaping accessories can be produced from the same sandstones – making colour co-ordination possible. 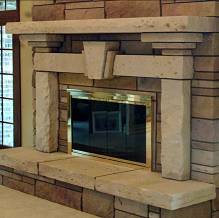 ** Sandstone veneer is lighter in weight and thinner than solid stone, thus allowing for narrower walls. ** Faster and simpler to erect than solid stone – hence significantly lower construction costs. ** Can usually be clad over existing masonry, making renovation or upgrading simpler. ** Quicker and simpler for the home handyman, easy to shape, easy to apply - affix with similar methods as for normal tiles. ** A totally natural and environmentally friendly product. ** Economically and competitively priced. The sandstone veneer can be custom produced at various thicknesses, our normal thickness is approximately 40mm thick (range ~30-50mm), with a weight to area conversion of approximately 10 square meters per tonne. * Due to the vast number of combinations available, not all items can be carried in stock, only our standard range is carried in stock. * Whilst we try to have sufficient stock available for immediate delivery, many items may require an order to delivery time of approximately 12-18 weeks. However, as with most natural products, we cannot guarantee on time delivery, so please plan ahead. These sandstones are also suitable for paving, either for internal or external use – hence you can have your interior/exterior floor pavers made from the same stone as your wall cladding. Our standard paver sizes are 600x600x20 and 900x450x20 with honed surface – however for special orders these can be custom sawn to suit requirements with a finish to suit your requirements (maximum size limit and order volume do apply and is different for each stone type). For special orders allow approximately 3 months for delivery. 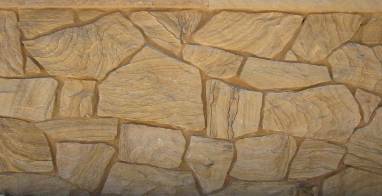 These sandstones are also suitable for steps, either for internal or external use. Our standard size is 1200x400x40 with either bull nosed or hand chipped leading edge with sandblasted non slip surface – however for special orders these can be custom sawn to suit requirements with a finish to suit your requirements (maximum size limit and order volume do apply and is different for each stone type). For special orders allow approximately 3 months for delivery. Can be custom produced to your requirements. Of most stone types in the cladding range we also carry slab sized pieces of stone at 30, 40, 50, 60, 75, 100 and 150mm thicknesses (not all thicknesses and stone types are covered – stock range varies with time). Special orders can be custom sawn to suit requirements with a finish to suit your requirements (maximum size limit and volume limits do apply and is different for each stone type). For special orders allow approximately 3 months for delivery. Pillars, finials, fire place surrounds, mantle pieces, hearth stones, table and bench tops, shower and floor tiles, etc can be produced to meet your design (within practical limits) from the same stone as the wall cladding/floor tiles. For special orders allow approximately 3 months for delivery. Garden Seats, Outdoor tables, Flower Pots and Urns, Bird Drinkers, Bird Houses, Gate Post Finials, Garden Gnomes or Figures, Fountains, Water Features etc. can all be hand carved (to your design and finish) from the same sandstones as the pavers and wall claddings if required. CONTACT DETAILS: PYRENEES QUARRIES PTY. LTD.
At Pyrenees Quarries we have a large selection of local stone products from our own quarries, and supplement this with different stone types from other Australian and overseas quarries. We offer retail sales direct from our factory facilities in Castlemaine. Our stone range includes building and terracing sandstone and slate, paving in random form, tiles and flagstones in polished and natural split surface, water feature stones, landscaping boulders and slabs, stone strata and cladding, stone steps (natural and worked), hearth stones, lintels, table tops, granite and marble slabs, lawn edging, cobble stones etc. At Pyrenees Quarries we specialize in producing unique products to suit our customer’s wishes. We have experienced stone masons and facilities available to modify, cut, profile, polish, drill or shape stone to your requirements, and have a vast range of stone at our 3 acre site for you to choose from. 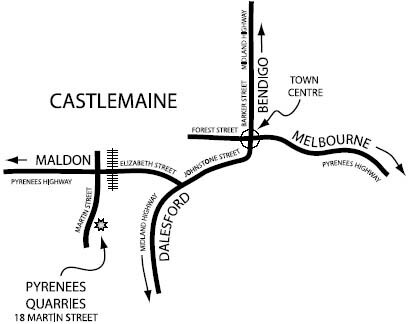 Castlemaine is situated just over one hour driving time from Melbourne CBD. Should you be contemplating using stone or are just interested in natural stone, we suggest you visit our facilities in Castlemaine. * PYRENEES QUARRIES PTY. LTD.
*CASTLEMAINE SLATE SANDSTONE AND GRANITE SUPPLIERS.